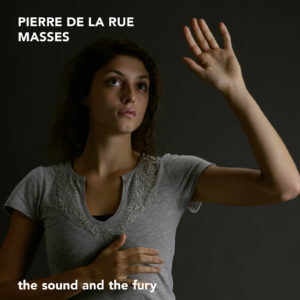 Pierre de la Rue is one of the most fascinating and yet most elusive members of the supremely talented generation of composers from around 1500. Apart from his will tentatively suggesting Tournai as his birthplace, we know nothing definite about his early years; any identification as the singer Peter van der Straten (the Dutch equivalent of the name Pierre de la Rue), active in The Netherlands and Germany between 1469/70 and 1492/93 has been put into question with good reason. On the other hand, we know a great deal about the last twenty-six years of his life. La Rue became a member of the Burgundian Habsburg court chapel in service of Philip the Fair and subsequently his widow Joanna of Castile and finally his sister Margaret of Austria, sometime between 1489 and 15th November 1492 (the first recorded mention of his name). He passed the final years of his life, from 1516 to 20th November 1518 in Kortrijk, where he benefited from an ecclesiastical sinecure. La Rue’s personality also remains elusive; not even the slightest anecdote gives any hint, unlike the cases of Busnois, Isaac or Josquin. We only know from his epitaph that he was devout, charitable and “chaste and free of the sins of Venus” (castus et a Veneris crimine mundus). That may well be true, for La Rue made his name with sacred music and there is no trace of the frivolous, dubious or obscene texts which his contemporaries were wont to set amongst his secular songs. The melancholic tone prevalent in many of his pieces can best be understood as part of the representational politics of his last employer Margaret of Austria, who owed her powerful position as Regent of the Netherlands to her status as a double widow. Margaret consciously emphasised her widowed condition which permeated the whole court with an atmosphere of mourning and melancholy. But there are certainly other aspects to La Rue’s music. The Virgin Mass — one of a significant handful by La Rue — presents an even more exuberant, even sparkling setting, and is a real high point itself. In contrast, the second disc seems a little less accomplished interpretation-wise, but does reprise the Missa L'homme armé after a rather long interval, and moreover attempts the Requiem at pitch. Both end up a bit murky (including the low parts in the L'homme armé) — & do recall that Visse's group had been supported by organ, helping to bolster what was a relatively coherent interpretation for the time. So whereas the previous SATF La Rue album presented later technical tour de forces, here after the relatively youthful Missa L'homme armé, they've presented relatively straightforward (albeit still challenging) mature settings on plainchant themes. And so this disc was added to my personal list.